Slipping more and more comfortably into its reputation as the “Vegas of the East,” Macau plays host to a dizzying array of large-scale casino resorts. Famously the world’s biggest gambling hub, it is one of two Special Administrative Regions of the People’s Republic of China – the other being neighbouring Hong Kong. Macau showcases many of the same brands as its Nevada counterpart: MGM, Wynn and Sands are all in town, while its flagship Venetian Resort – complete with canals and mock Italianate plazas – is currently the largest casino on the planet. But there’s more to the destination than poker tables and betting halls. When Macau's historic centre was added to the UNESCO World Cultural Heritage list in 2005, it underlined the strategic and cultural importance which the territory has had over the centuries. Portuguese colonists arrived in the mid-16th century and developed Macau into a major regional trading post. They held onto it long after it had been eclipsed by Hong Kong as a magnet for merchants; longer than they held onto Goa or Brazil. Overlooking the South China Sea, Macau consists of a peninsula and two small islands, Taipa and Coloane. The three areas have been artificially joined by land reclamation, much of which is covered in casinos. 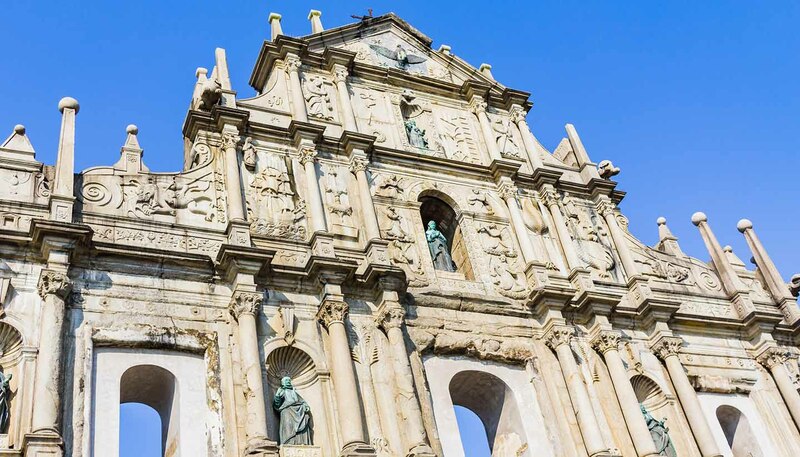 Mercifully, it is possible to escape the neon lights and gambling dens in Macau’s urban parks and historic centre, where colonial Portuguese architecture sits among the bustle of a modern Asian city. The street stalls and restaurants of the old town are also a fine introduction to local food, which encompasses traditional Chinese and Portuguese dishes alongside Goan, Brazilian and African influences. 28.2 sq km (10.9 sq miles). 601,969 (CIA estimate July 2017). President of China Xi Jinping since 2013. Chief Executive Fernando Chui Sai On since 2009. The typhoon season in Macao normally runs from April to October. You should monitor the progress of approaching storms and follow the advice of the local authorities. Although there’s no recent history of terrorism in Macao, attacks can’t be ruled out. Crime levels are low, but you should take sensible precautions against pick pocketing and other street crime. In 2017, 57,122 British nationals visited Macao. Most visits are trouble-free. Consular support may be limited in Macao. However, the British Consulate-General in Hong Kong can provide consular support to British nationals. Although there’s no recent history of terrorism in Macao, attacks can’t be ruled out. You should be aware of the global risk of indiscriminate terrorist attacks, which could be in public areas, including those frequented by expatriates and foreign travellers. Crime levels are low but pick pocketing and other street crime can occur in some areas. Take extra care of passports, credit cards and money in crowded areas. Be careful of your belongings when checking out of hotels. Take extra care when visiting casinos late at night. The Tourism Crisis Management Office (853) 2833 3000 (24 hour hotline) are able to provide general assistance in English, Cantonese, Putonghua and Portuguese to tourists in Macao. Do not become involved with drugs of any kind. Possession of drugs can lead to imprisonment. Do not take photographs of military installations. Take care when visiting Macao to stay in licensed accommodation. You risk penalties of up to MOP3000 (£300) if you stay in illegal accommodation. See the Macao Government Tourist Information website for more details. The Macao authorities consider the taxi service Uber to be illegal, and the Macao Police has recently been taking enforcement action against both the drivers and passengers of unlicensed taxi services, including Uber. Although Macao is now part of the People’s Republic of China, it remains a Special Administrative Region with its own immigration controls. You can stay in Macao for up to 6 months without a visa. If you intend to work in Macao you must get a visa before arrival. Contact the Macao Immigration Department. Your passport should be valid for a minimum period of one month from the date of entry into Macao. If you are staying longer than one month your passport must be valid for the duration of your visit. If you intend to travel to mainland China via Macao using a British passport you must get a Chinese visa before arrival at the border. Failure to do so could result in a fine and possible detention by the mainland Chinese authorities. If you’re entering Macao via mainland China and leaving again via the mainland you’ll need to have a double or multiple entry visa to re-enter mainland China. UK Emergency Travel Documents (ETDs) are accepted for entry, airside transit and exit from Macao. Dengue fever is common in Macao. You should take precautions against mosquito bites. The typhoon season normally runs from April to October. Typhoons very occasionally hit Macao and may cause flooding and landslides. Warning is given in advance. Public offices shut down when the ‘Typhoon 8’ signal is hoisted. You should follow advice issued by the local authorities. Monitor local and international weather updates from the World Meteorological Organisation, the China Meteorological Administration and the Japan Meteorological Agency. See our Tropical cyclones page for advice on what to do if you’re caught up in a tropical storm.